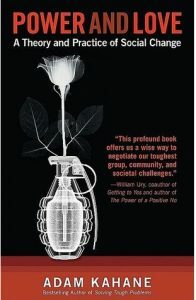 Power and Love: A Theory and Practice of Social Change digs into some of the tougher and significant challenges of social change. The author Adam Kahane’s book bases on first-hand experiences working with teams, governments and civil society leaders around the world. It is both a profound and personal book which shows the practical ways of social change. The author takes us on his journey, and his learning process, and he gives us insights into how to thrive in a world that is both competent and caring. He argues that the two main ways people try to solve difficult group or societal dilemmas have some fundamental flaws, though they also have two fundamental drivers that are within us all: power, the single-minded desire to achieve one’s sole purpose; and love, the drive towards unity. We think this is a book for any professional who recognizes the need to merge business with communities and governments to address the sustainability challenges of our time. Welcome to the Tribe Copenhagen 8-9th June 2017! Book Recommendation #8: Delivering Happiness: A Path to Profits, Passion, and... Welcome to the Tribe Copenhagen 8-9th June 2017!